We'd like today to draw the attention to the Call for Papers reported below. The interdisciplinary conference which has to be organized next December 2013, aims to discuss how visual arts reacted to and suffered from the Word War I, focusing on the single year 1914. This could offer a chance to reconsider this very special field of human production and innovation, both from an intellectual-spritual and a material-economical point of view, and to appreciate so the role played by the avant-gardes of the early century. With its origins in military vocabulary, the metaphor of the « avant-garde » ran through the art world with particular intensity at the beginning of 1914. In both Europe and the United States, contemporary arts tackled modes of conflict and rupture, the leveling of the recent past and the authoritarian conquest of a utopian future. This militant train of thoughtcan be traced in the fine arts, as well as in other forms of visual expression, from photography and cinema to decorative arts, the arts of industry and other image technologies. These practices were as concerned with theoretical and critical discourse as they were with material production. In this context, the phenomenon of internal fragmentation – of groups, trends, inspirations – existed alongside an aim for universalism, driven by the dream of abolishing the boundaries between the arts and, more radically, between different world views. The quest for crossover and interaction between the languages of philosophy, music, dance, visual arts and literature led to the desire to interweave time and place, cultural and religious traditions, and to abolish the hierarchies between different forms of expression. Around the notions of “primitive”, “popular”, “infantile”, as well as “technological”, “rational” and “scientific”, a common psychological and anthropological horizon seemed within reach, to put an end to the fractures between nations, as well as individuals. Yet rivalries continued: national consciousness continued to sharpen in the field of the “avant-garde”, to ensure the mastery of the future. Kandinsky, a Russian living in Germany and exhibiting in France, made abstraction into the intuitive grammar of the language of “humanity”; but, in homage to Matisse or Delaunay, he also denounced the “sensuality” of the French tradition. In August 1914, real and immediate violence seized individual destinies and brutally reoriented them: foreigner and enemy, Kandinsky was forced to flee Germany to evade internment; his German friends of theBlauer Reiter-groupjoined the frontline, where August Macke was killed only a few weeks later. In Paris, Guillaume Apollinaire, who was preparing to give a conference in Berlin in January 1915, became the spokesman for a virulent patriotism and immediately signed up to fight. 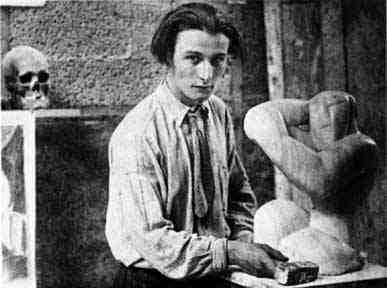 The young Henri Gaudier-Brzeska, who had been living in London since 1910, moved from anti-militarism to a poetry of modernist violence in the circle of Ezra Pound, before dying in the trenches in 1915. Those such as Romain Rolland, Pierre-Jean Jouve, Maurice Loutreuil or, more briefly, André Masson who chose exile in neutral Switzerland or Italy to maintain their pacifist discourse were rare. This interdisciplinary conference aims to interrogate the complex relations between the visual arts, in their largest sense, and history, at a moment where the European crisis of conscience crystallized into catastrophe. Restricting itself to strict temporal parameters – between 1st January and 31st December 1914 –it will explore the intellectual and practical circumstances of visual creation during the first six “ordinary” monthsof the year, whilst also seeking to understand as precisely as the possible the nature of the realizations provoked by the start of the war as well as by its first engagements. Works and objects, the orientation of taste and of the market, critical and theoretical discourse will be exploredin order to dissect that which was shattered in western representation between January and December 1914. This conferenceisorganizedjointly by the "Centre allemand d'histoire de l'art"/Deutsches Forum fürKunstgeschichte, l’université de Paris Ouest – Nanterre – La Défense and l’Institut universitaire de France. It will take place in Paris on 5th and 6th December 2013, at the Institut national d’histoire de l’art and the Deutsches Forum fürKunstgeschichte. Oral presentations, of twenty-five minutes in length, will be in French and English. They will address visual culture in Europe in its largest sense, within the strict parameters of the year 1914. A provisional title and proposal in French or English, of no more than 300 words, should be sent, in one document along with a brief C.V., to Marine Branland colloque.arts1914@hotmail.fr, before 15 February 2013.